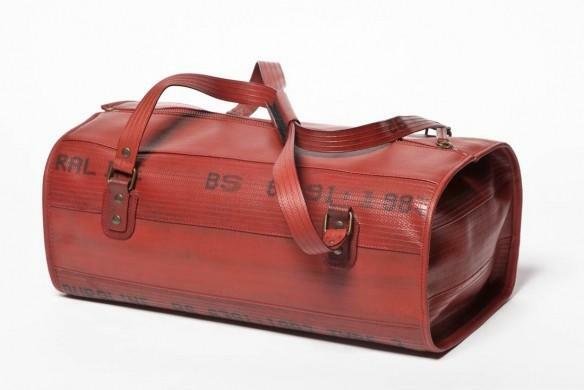 Elvis & Kresse is a UK-based business that creates incredibly special bags and accessories. The story began in 2005 when founder Kresse Wesling discovered that London's decommissioned fire hoses were being sent to landfill. Used fire-hoses retain many of their qualities - they are strong, bright and satisfyingly tactile. Of course, these materials also have a heroic backstory that give these unique products a magical quality. Since then, the team have been perfecting the technique of turning these decommissioned hoses into exciting alternative textiles – beautiful, characterful, robust and mostly red. Each product is a one-off and carry with them the battle scars of life on the front line. The upcycling genius is to build these characteristics into the beautiful and refined finished product. More materials have since been added to the process including parachute silk and leather. The ability of Elvis & Kresse to respect resources that other consider waste and create things of great function and beauty light the way to new kinds of business and an economics without landfill, when everything is reused, recycled or composted. Elvis & Kresse make honest, genuine, practical pieces; from the belt you leave on your favourite jeans to the bag you couldn’t leave home without. But if that wasn't enough, the company also re-distributes up to 50% of it's profits to projects and charities related to the unique materials they reclaim. 50% of the profits from our fire hose range are donated to the Fire Fighters Charity. At a time of extreme ecologcial deterioration it is tempting to view all business as bad but Elvis & Kresse are a beacon in the gloom. Here is a company that gets it right.